Often there will be no land use taxes if you build a house on your land. Don't let a lack of money keep you from building. Do the house with regional organic methods. Tires, Strawclay! Many of us own homes on very clay like soil. Thwis can be amended so that you can garden, but clay has a fabulous use. Building your rural, country home! I wrote the expert about this. DEAR TIV: The Clay soil in my yard is hard as cement after El nino rains. Knives bounce off it. Shovel can't pierce a dune. Woe is me for moving here. But you're telling me I can mix straw with it, pour it into FORMS and let it dry into building bricks? What an idea? 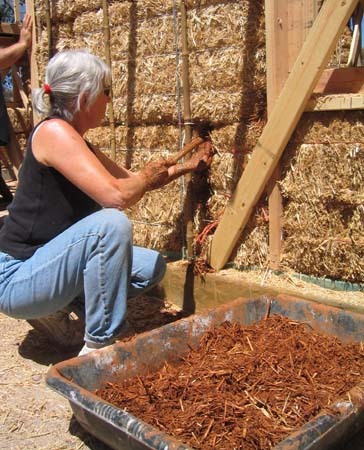 Clay/straw houses are just SOIL poured into plywood forms? "ANSWER: There are a large number of building techniques that use earth. Some are traditional, like strawclay; some new, like earth-ships made from tires packed with dirt; some are updated versions of traditional methods, like adobe with added stabilizers so it will work in wet climates. Strawclay is mostly straw packed into forms. There are also techniques that are mostly dirt either packed while only damp to poured almost like concrete. Wattle and daub is an other traditional infill for post and beam. 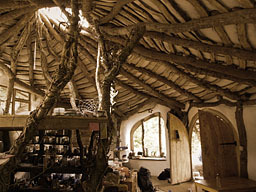 It uses a woven layer of sticks (willow is traditional) and is covered in mud. Subscribe to a MAGAZINE on the theme maybe a good idea? They have classes, sessions, 2 day or 5 day. 9 mos a year. But their site doesn't show you everything. Or even very much. They offer expensive courses, though, not much on their site. Concrete Canvas Shelters are rapidly deployable hardened shelters that require a light truck, an air pump and a water hose for construction. The key to CCS is the use of inflation to create a surface that is optimized for compressive loading. This allows thin walled concrete structures to be formed which are both robust and lightweight. CCS consist of a cement impregnated fabric (Concrete Cloth) bonded to the outer surface of a plastic inner which forms a Nissen-Hut shaped structure once inflated. When you first buy your acre or two, as a farmer you want to make it fertile, fluffy semi acid black soil with WORMS in it ---BUT if it's CLAY don't worry. YOU CAN BUILD YOUR HOME out of the clay excavage a big hole of this clay, (make a root cellar in the hole,) then you can take almost any soil and amend it with leaves, small branches, green crops and get it fluffy and acidic. http://www.forfarmers.com/ Go to this site, it's a marketplace for buying and selling new and used farm machinery, equipment, seeds, crops, livestock and a wide range of services including job opportunities. When you have CLAY SOIL it's an asset FOR BUILDING walls of course adding cement, lime or sometimes even an oil like linseed oil and it becomes a stable building material. Cover the outside with a stucco of either cement or lime and it is weatherproof enough for any climate in the world. A man named "Mark Lung" lived in a straw-bale house in Gunnison, Colo., before moving to Boise. While there, he carefully charted the temperatures over an extended period. The outside temperature ranged from 20 to 80 degrees. Inside, the temperature stayed between 68 and 72 - without supplemental heat or cooling. Google his name, Colorado, Idaho, on 'IMAGES' and see if you can find articles with pictures. Lung mounts enough rebar to go through the first straw bale into the cement foundation then uses sharpened bamboo to secure the bales on top of the first. The bales are set on two rails with a trough in the middle that is used for electrical conduit, which is sent up any of the posts that come every 8' in the wall. The dirt removed for the foundation is used in forming the wall plaster. The whole house does not have to be straw and wattle At a list, T Canava says : I'm the cheapest person I know. Instead of buying a house I bought a very cheap acre in a fertile valley. I put an ad in the paper saying FREE HOUSE DEMOLITION... I got my pick of houses. I took the house that had best wood features apart and hauled it to my land and rebuilt it. (We assume he means doors, door frames, lumber, beams, bricks, features that give a country home BEAUTY.) Instead of paying thousands on a mortgage I pay $221.00 a month for the land." POSTER's NOTE: AMAZINGLY INGENIOUS! News has surfaced that using Hemp fibers in your Bricks makes them harder than concrete for homes and buildings! The French woman who reinvented the ancient use of hemp fibers for buildings put these up. And if the house ever burns down, you can sit there and trip out. Now, a dessert for your eyes, an amazingly beautiful, spiritual, Medieval home in Wales. This would be easy to build. Cost this fellow 3thousand pounds, is that like 5k? HUGE, well fitted out with accessories and very pleasant on the eyes. Ya have a feeling if your local codes would allow this? They would if your architect DREW it right. Before you do the house, BUILD AN "EARLY START" HOTBED, a "PLANT BUNKER" for your Spring seedlings, so you can push the 'plant seed' date up, earlier, ever earlier, protect tender greens from icy winds and early frosts. Then while you're building your house, your vegetable garden is racing to keep up with you so dinner will be on the table when you finish the kitchen! <=== SHOW ME "THE FIX" INDEX PAGE. 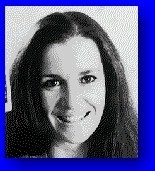 <===BACK TO THE REAL ESTATE SECRETS WEBSITE. POOR MEN CAN BUY HOMES!